When taking on homelessness, Aaron Sando's goal is to connect with and help one individual at a time. 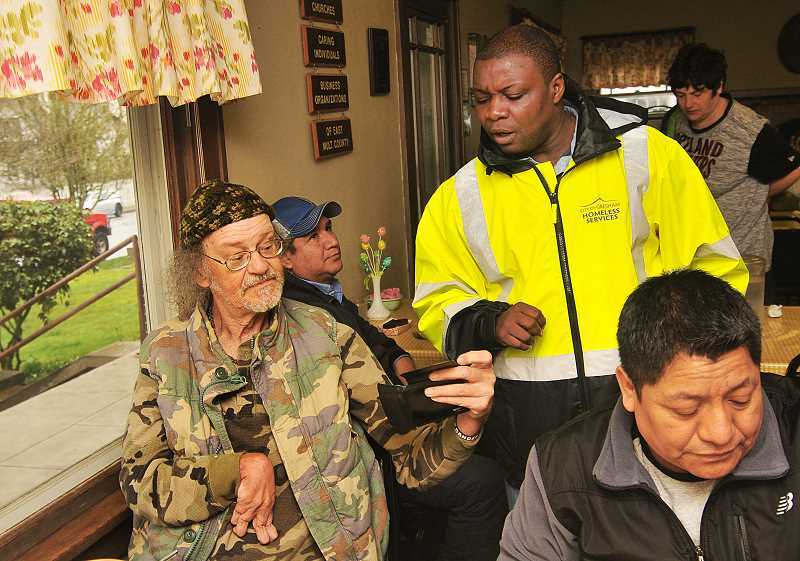 During his daily walks in the community, Gresham's homeless services specialist meets with people who need assistance. On Monday, March 12, he spoke with one man who was on the cusp of escaping the streets. His friends in Happy Valley had a place for him to stay, and after Sando called to confirm the arrangement, he was able to drive the homeless man to his new living arrangement. "Even if he is back on the streets a week later, it still is a chance for him to be warm and around those who care about him," Sando said. Later that day Sando received a phone call from a young woman in the community whose father had lost his job and home. The man used to drive semi-trucks, and with help from Sando was able to renew his commercial driver's license. "He now can be making money again," Sando said. "It empowers him to get off the streets." The city of Gresham is working to support its homeless citizens while not neglecting the state of neighborhood livability. That delicate balance between support and enforcement is one of the focuses of city leadership. Through a wide array of programs, like Sando's position, the city is working to find new ideas to support its most vulnerable citizens. 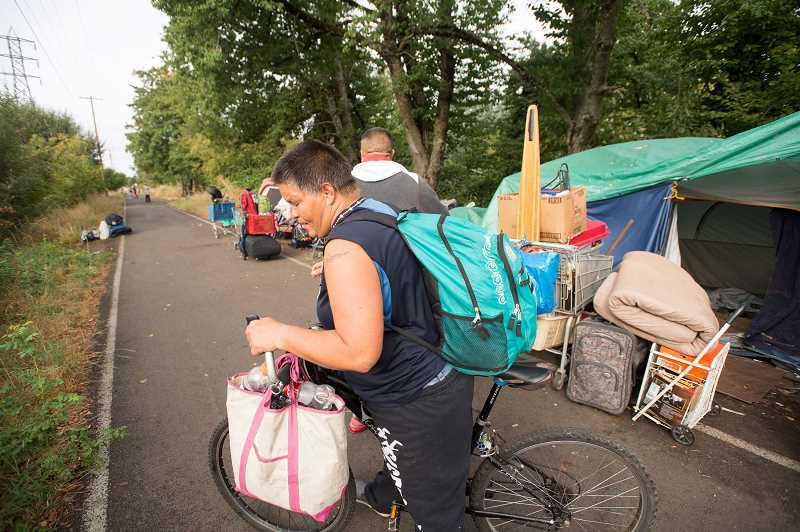 "The homeless issue is such a huge societal problem," said Gresham Mayor Shane Bemis. "It's vexing because there is no one solution, but we need to provide resources to folks to get up and out of a bad situation while not overwhelming neighborhoods with camping or abandoned RVs." Most of Gresham's programs in support of the homeless population were enacted in 2015 as a response to regional concerns. As Portland struggled to deal with homeless people, more of them were being pushed out into the suburbs, forcing Gresham to focus more than before on the homeless. City leaders, all of whom live within the community, were seeing firsthand the friction between the homeless, neighborhoods and businesses. "We focused on making programs that work for Gresham," Bemis said. "We wanted to try to add to the tools we have available while not destroying livability." A homelessness task force was formed to bring together diverse voices to speak on the issue. That group, many of whom had never served on a city committee, helped guide the Gresham City Council's practices. Gresham officials estimate there are roughly 300 homeless individuals in the community, though the majority of those people are staying in shelters. Of the 100 who find themselves on the streets, it's difficult to pin down exact numbers because of the population's transient nature. One of Bemis' major talking points during his State of the City address Thursday, March 15, was efforts being made on homelessness, including a video highlight for Sando. The city has held strong on the enforcement side, he noted, maintaining city codes and livability rules. One thing the city said it won't do is ignore dilapidated RVs along neighborhood streets or camping in public spaces. "That may sound harsh, but there is nothing compassionate about letting mentally ill or severely addicted humans live in the squalor of a thin tent," Bemis said during his speech, to applause. "There is nothing acceptable about letting that happen in our neighborhoods." To try and support the homeless, the city has identified resources through partnerships with regional groups. During last year's State of the City address, Bemis announced Gresham's Clean Start program, which pays formerly homeless individuals to clean up garbage, litter, debris at camps. This year Bemis announced another new program. 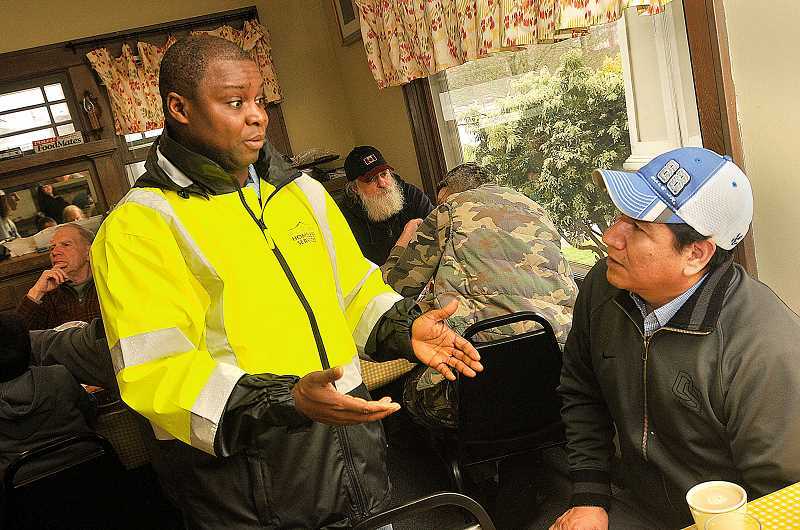 As of March 5, the city has partnered with Central City Concern to create the Community Volunteer Corps, which is available to homeless people in Gresham seeking treatment. Paid a daily stipend, volunteers will provide a dedicated resource, with duties including picking up litter, painting curbs, removing graffiti, cleaning up parks and working for local nonprofit agencies. Gresham police, mainly through the Neighborhood Enhancement Team, is also working to build relationships with the homeless population while ensuring everyone is comfortable with the situation. But through all of the programs, Sando is still the frontline for homeless services. He's the person walking the streets, trails and parks looking for people to help. "If you would have asked me 10 years ago if we'd have an employee in this arena, I would have told you no," Bemis said. "But changing times require us to change and adjust with them, and this approach is what the pressures of our day demand." 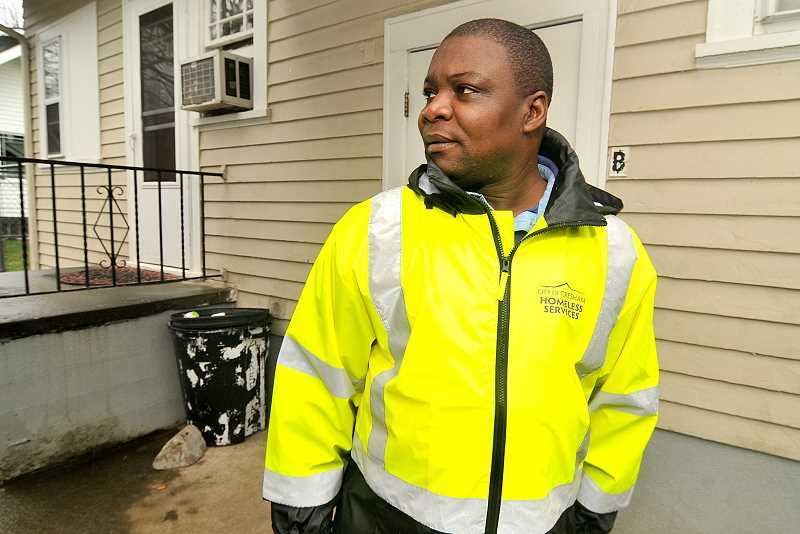 Sando, 42, has always been passionate about helping others. Born and raised in Liberia, Africa, he as a 9-year-old he dreamed of becoming a doctor. That desire for providing aid turned into a love of social work and connecting with people. After graduating high school, he was sent to England to do missionary work for his church. While he experienced culture shock, he quickly became used to the country. "When I got back home I knew this was truly what I wanted to do," he said. "You begin to look at everyone as having something to contribute." Sando came to the U.S. for college, enrolling in Brigham Young University in Utah in 2002 to pursue his undergraduate degree in sociology and criminal justice. He worked for the state of Idaho doing mental health services in the school system, before enrolling at Boise State University for graduate school in 2013. Sando moved to Oregon in 2016 to continue working in the mental health field, before being hired to his current position that December. Now he works 10 hours a day Monday through Thursday, and is on call for emergencies. As the homeless services specialist, Sando acts as the point of contact for anyone in need while helping secure resources. He works with local businesses, shelters and any organization interested in providing aid. His main goal is to build relationships with people those used to being overlooked, along with reaching out and forming connections. "I link the homeless with housing services and help them get into permanent situations," Sando said. One of the most popular services he provides is taking people to get driver's licenses, birth certificates and identification cards, paying for those services using a stipend from the city. "I like to help people out, it brings me happiness," Sando said. "I meet people where they are and offer help." Sando also meets with local businesses, listening to their issues and concerns. He offers advice on how to deal with a homeless person, and often finds the businesses just want avenues to provide aid, even if it's something as simple as a cup of coffee. "Almost everyone wants to do whatever they can," Sando said. While there is no perfect solution to homelessness — a matter complicated by addiction, mental health problems and a lack of resources — the city keeps searching for creative answers. For his part, Sando plans to stay in his new community. "I see myself doing this as long as it takes," he said. -- Homeless Services Specialist: The city's in-house employee works directly with the homeless population, providing a single point of contact for police and citizens to refer people in need. -- Clean Start: In partnership with Central City Concern, this program keeps the trails and open spaces clean while employing individuals coming out of homelessness. In 2017, the Clean Start crew cleaned up more than 300 camps. 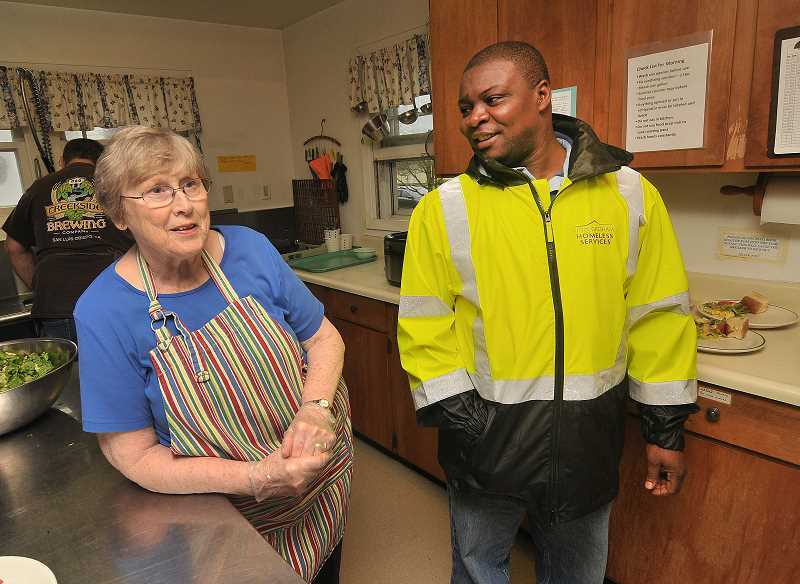 -- Community Volunteer Corps: Gresham's newest endeavor provides 60-hour volunteer opportunities for residents who are transitioning from homelessness and addiction. Participants can give back to the community through litter clean-ups, tree plantings and graffiti removal. In return, they receive a small stipend and work experience.